A law firm recently contacted our oceanography research group with a request for research on whether or not the Marine garbage Transfer Station (MTS) proposed for 91st Street in Manhattan would cause navigational problems. If we were willing to do some research into the question, they would be ready to have a “preliminary discussion about the cost and scope of our work”. So, I plotted up a map of the typical average current around Manhattan, which reaffirmed for me that the site is actually very well-chosen for its safe navigational conditions. 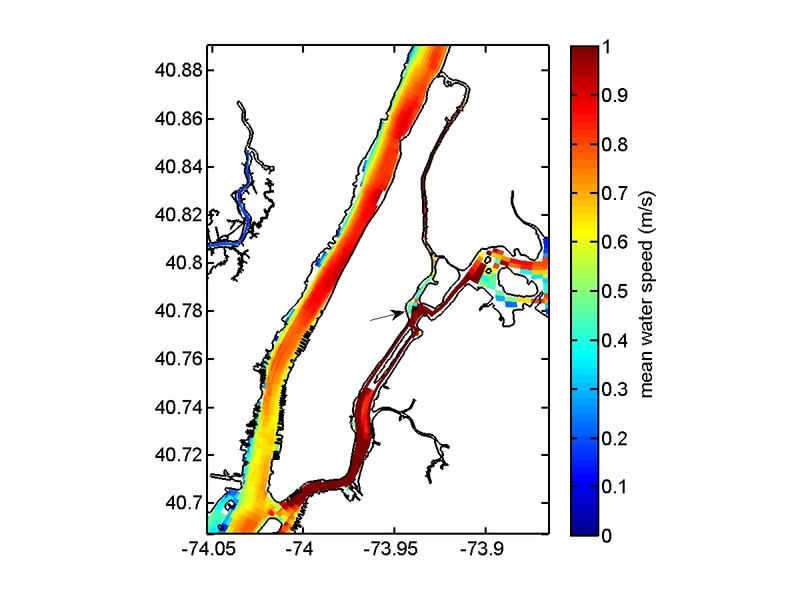 Map of the average tide-driven water speed in the vicinity of Manhattan, New York City, with longitude and latitude axes. The arrow shows the site of the proposed MTS, the location with the weakest currents. 1.0 m/s is equal to 2.2 mph. Estimates are based on the NYHOPS computer model. A little background: New York City is planning to build the MTS so that they can reduce emissions from garbage trucks and long-haul trucks, as well as to stop trucking our garbage through mid-town to neighborhoods in Newark and Jersey City. This question of navigational safety is another front being opened in the Upper East Side community efforts to stop the MTS. They have also claimed that we should stop the MTS because it will be bad for the environment, which I repudiated in a recent Op-Ed. 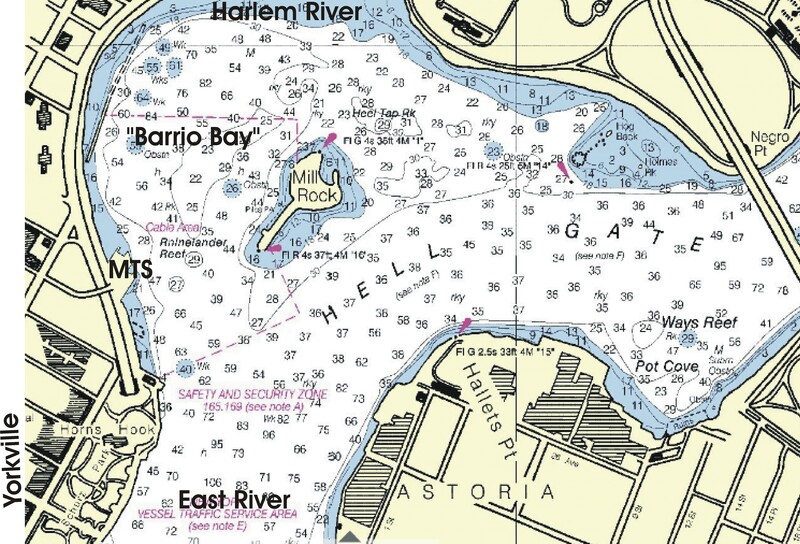 This site isn’t really in what’s typically perceived by mariners to be Hell Gate (see below), so much as it is in a calm-water embayment off to the side (it should be given a name — how about “Barrio Bay”). Ship traffic mostly follows East River out to Long Island Sound, so doesn’t go behind the small island (Mill Rock) into this embayment, so there is no obvious reason why the new expanded MTS would cause navigational danger or problems of any sort. Historically, at least prior to about ~1915, there actually were many piers in Barrio Bay, and these were eventually filled in and covered by the highway (check out the “greatest grid” exhibit at the Museum of City of New York). So, to me, this is just another one of many flailing efforts to stop the MTS with any means possible (and with high-priced law firms). Yes, one must respect the reasonable concerns of residents that the trucks could worsen safety or air quality locally in Yorkville. However, nothing presented so far has convinced me, or the City Council, or the State Department of Environmental Quality (Impact Review PDF), that these changes will be anything more than incremental — currently, a highway runs right past here, and many large trucks already speed down avenues in this area (York and First Ave). I live in the neighborhood and fully support their building the MTS. This entry was posted in air pollution, opinion, water and tagged 91st Street, Carolyn Maloney, currents, dump, East River, garbage, Hell Gate, Liz Krueger, Manhattan, MTS, navigation, Newark, ships, speed, trash, Upper East Side, velocity, waste, Yorkville. Bookmark the permalink. 7 Responses to Where are the Currents Weakest Around Manhattan? Yes, it’s a complete backwater there—hardly any current, and completely out of the way. Vladimir – do you think our model overestimates the average current speed there? We don’t have great spatial resolution for the model at that site and in Harlem River, so it may not be as accurate as we’d like. My sense from walking and biking past there many times is that the average current speed is probably even weaker than 1 mph. Average meaning averaged over the whole tidal cycle? That would probably be quite a bit less than 1 mph. But it depends exactly where in that embayment. Close to the Manhattan shore there’s hardly any current at all, whereas farther out, along the western side of Mill Rock, there is significant current. Thanks for being a voice of reason on this issue. As I keep telling my NIMBY neighbors, if they spent half as much time reducing the amount of garbage they created as they spent opposing the MTS, the world (and our neighborhood) would be a much better place. If I recall correctly, another way to show that this spot does not have very strong currents is that people fishing nearby catch flounder, which only live in areas with slow-moving water (I’m not a scientist, so I could be wrong about that). Waaaay back when I suggested to the organizers of the opposition that if we tried to work with the city rather than fight the MTS, the community might be able to get some benefits from this project (think like at the North River treatment plant). My suggestion was rejected. Some people would rather be opposed to, well, anything, rather than compromise and make something better.